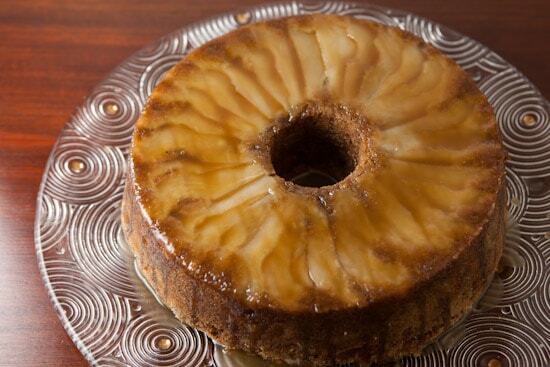 It’s definitely time for another installation of Food Blog Friday and this week I’m featuring a gorgeous Caramel Apple and Pear Cake recipe from the wonderful baking blog Zoë Bakes, written by pastry chef and cookbook author Zoë François. Even if you aren’t familiar with her blog, you might recognize Zoë as co-author of the popular bread baking books Artisan Bread in Five Minutes a Day and Healthy Bread in Five Minutes a Day. The books are great and so is the Artisan Bread in Five blog, but it’s really been a pleasure getting to know Zoë through her personal baking blog over the past few years. 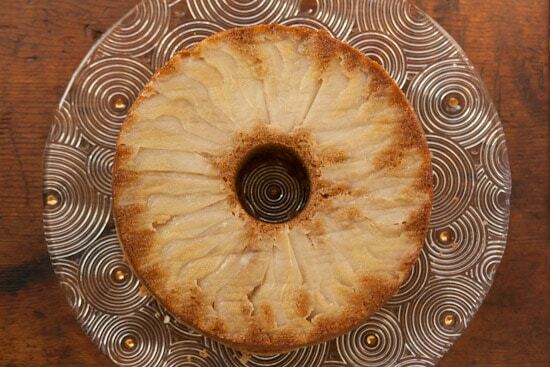 When I was searching for a Caramel Apple Cake recipe yesterday, I was thrilled to find this recipe. 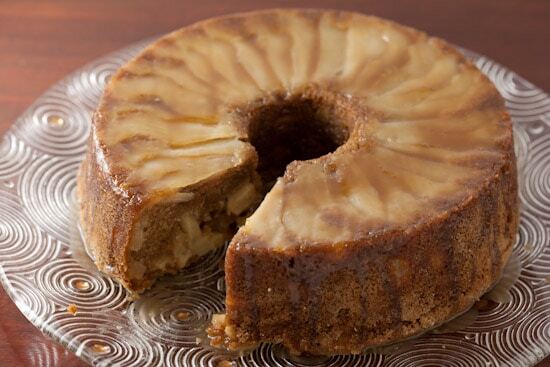 The sweet cake is filled with apple chunks and flavored with cinnamon, nutmeg, vanilla, and a touch of brandy. 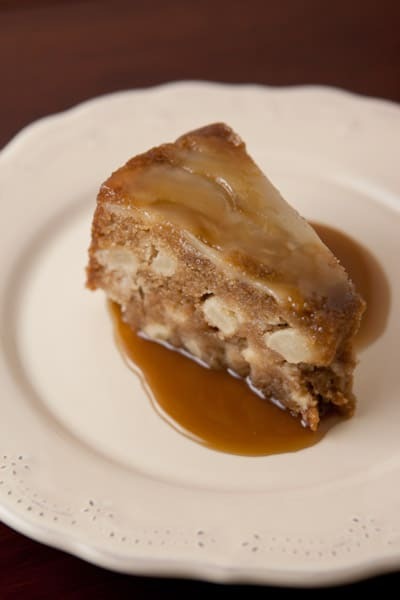 It is topped with an overlapping layer of thin pear slices and glazed with a caramel sauce. Although I hadn’t originally planned on using pears, I fell in love with the pretty design on top of the cake and knew I had to give it a try. The cake is very elegant looking, but was really simple to make thanks to the step-by-step photos and clear instructions. When my cake came from the oven, it looked great, but I was a bit nervous about removing it from the tube pan. I was afraid the pear design wouldn’t come out right or that something would stick or that I would somehow break the cake. 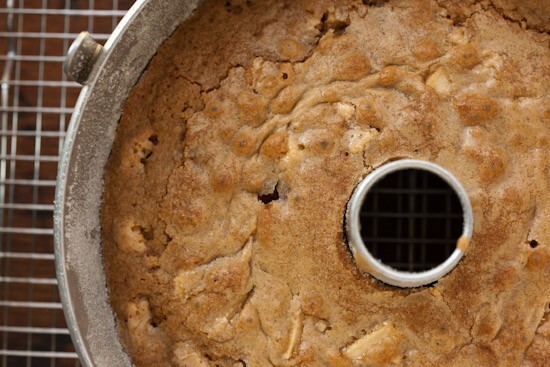 There was no reason to be afraid, the cake slipped out of the pan with no problems and the parchment paper peeled right off the pears and revealed the layered design. Once the caramel sauce was poured over the cake, it looked even better! 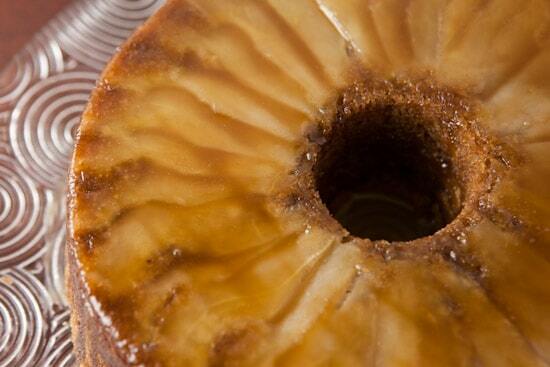 The cake was unbelievably moist and the simple caramel sauce with hints of brandy and honey was especially delicious. Zoë served hers with ice cream, but I suggest eating it like we did, with mounds of lightly-sweetened fresh whipped cream. Amazing! It turned out beautiful! It looks sooooo good! Yay! that cake looks so lovely! What a beautiful cake. I thought Zoe was so charming when I met her at BlogHer Food last year. Oh. My. God. It is 7:05 a.m. and I am sitting here drooling. What a beautiful cake! I'm gonna have to check out Zoe's blogs. That cake looks so delicious, and gorgeous!!! Now I kinda want cake for lunch! wow that looks incredible! you did a beautiful job! This is a gorgeous cake. You did a great job of arranging the pear! Mine would turn out no where near that beautiful. Thanks for the link to Zoe's blog. I've seen her cookbooks and it'll be nice to read some of her thoughts. Wow that looks gorgeous. The pears have a glassy, underwater sort of look!! What a beautiful cake!That cake looks so delicious, and gorgeous!!! Now I kinda want cake for lunch! This is lovely. I had tried the recipe and my family and friends love it. Thanks for sharing. I made this cake as the dessert for my family's Christmas gathering this year and it was a huge hit! I got really worried when I made the batter and it was so thick I had to spoon and not pour it into the pan per the instructions but it baked up perfectly (did anyone else have that problem?). Thanks Zoe for the great recipe, it will definitely be getting printed out and added to my recipe binder. Much appreciated.